The 2011 Chevrolet Volt, which debuted December 2009 at the Los Angeles Auto Show in Los Angeles, will cost $41,000 when it goes on sale in November, though it can be leased for $350 a month. DETROIT  General Motors Co. said Tuesday its Chevrolet Volt electric car will start at $41,000 when it goes on sale in November. While the price is about $8,000 more than its closest rival, the Nissan Leaf, GM will offer a $350-per-month lease deal thats essentially identical to the Leafs. 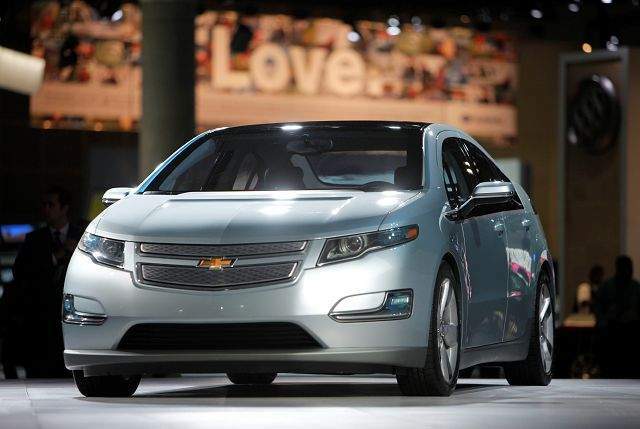 That will put the battery-powered Volt within reach of many people, GM said. Both cars also are eligible for a federal tax credit that will cut their prices by $7,500. The Volts price would fall to $33,500, while the Leafs would drop to $25,280 from $32,780. Some states, such as California, Georgia and Oregon, offer additional tax breaks that lower the price further. Thats a big selling point because some drivers worry about the battery going dead during trips. This so-called range anxiety dogged GMs experimental EV-1 electric car in the 1990s. To give the car wider appeal, drivers must know theyre not going to get stranded, said Joel Ewanick, GM vice president of U.S. marketing. Nissans Leaf, which goes on sale in December, can go up to 100 miles on a charge. The car doesnt have a gas engine and must be recharged once its battery is depleted. Nissan spokeswoman Katherine Zachary said the Leaf itself emits no pollution and is designed for people whose daily travels are within its range. GMs $350-a-month lease deal is for 36 months with $2,500 down. Nissans lease plan is $349 a month over the same period with $1,995 down. GM earlier this month offered an eight-year, 100,000-mile warranty on the Volts battery to allay fears that owners could get stuck with the hefty price of replacing the power pack. Nissan matched that warranty Tuesday, a day that saw competing electric car announcements from the two automakers. Nissan said Tuesday that 17,000 people have placed orders for the Leaf so far in the United States. Buyers in California, Washington, Oregon, Arizona and Tennessee will get the first Leaf deliveries in December. The Leaf will go on sale in other markets through 2011 and be available nationwide by the end of next year.